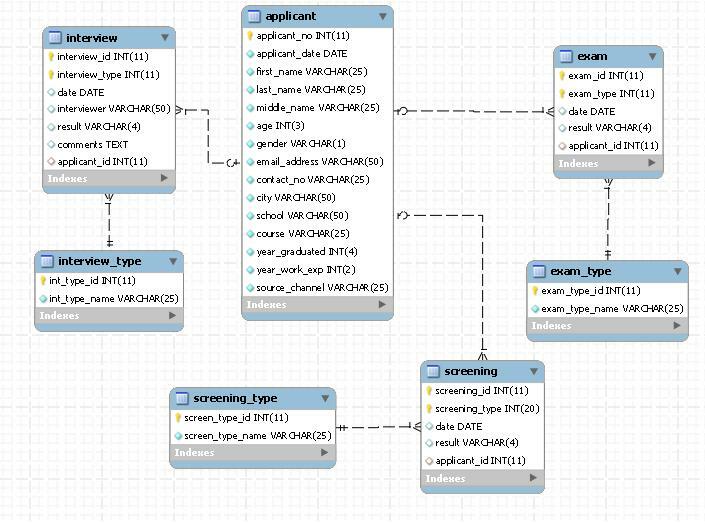 Am I violating any NF rule on my database design? I am a newbie on creating database... I need to create it for my recruitment web application. My application needs to schedule screenings, exams and interviews of applicants and save result in the database..
My problem is I included the applicant_id on other tables... e.g. exam, interview, exam type. Am I violating any normalization rule? If I do, what do you recommend to improve my design? There are few things to consider other than normalization. For instance, you have a column for AGE. Are you going to update that every year? How will you know when to do that? The same goes for years of experience. There are some columns that will probably have multiple values for each applicant: School, Course, etc. You may also want to check your optionality on those relationships. Right now an applicant must have a related exam, but an exam does not have to have an applicant associated with it. I'm guessing that's backwards to how things work in real life. You have similar issues with all the other relationships. It helps if you read out the relationships after you create them. I guess that you actually need a many to many relationship between your Applicant table and the other main tables (Screening and Exam mainly). That if you'd have a screening contain more than one applicant (and the similar situation for the other tables). I'd see an interview with a single candidate, but an exam or screening session with more than one candidate. In this case you will need a relation table that will link Screening with Applicant. See here about Many-To-Many relationships. Not the answer you're looking for? Browse other questions tagged normalization database-design or ask your own question. Should a composite primary key out of 3-4 attributes or a unique artificial ID should be used for the situation below?